Here's a closer view of the Princess korker bows. The large bows measure approximately 3 inches in diameter. 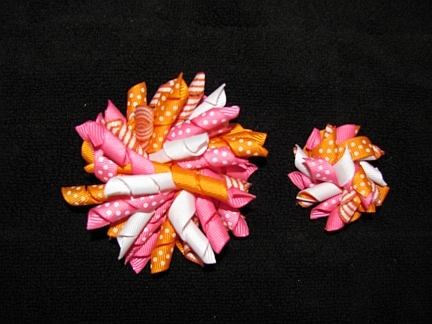 The doll-sized bows measure approximately 1 1/2 inches in diameter. Ends are heat-sealed & applied to a lined alligator clip. Free shipping when added to Princess shirts order. Shipping will be credited to your account.